Headteachers and deputy heads from schools across the UK came to Admiralty House, London, today to receive Pupil Premium Awards. The Deputy Prime Minister made the awards to schools for their work helping disadvantaged pupils get on and improve by innovative use of the pupil premium. Winning schools took home cash rewards of up to £10,000, in recognition of the way they have pioneered the use of the pupil premium - a £900 payment to schools for every pupil who is eligible for free school meals - to help those children reach their potential and reduce educational inequalities. Today’s awards ceremony was a chance to showcase the work they do so other schools across the country can learn from their impressive results. We’ve got to do everything we can to reduce the inequalities in our education system. I’m determined to help pupils who start school behind other children in their class to catch up. Everyone deserves the chance to do well and get on in life. Since April we’ve been investing £900 in each and every one of those pupils. School leaders and teachers are the frontline professionals working hard to come up with ideas to make a real difference to them, so it’s great that we are recognising what works best. From the south west to the north east, the judges were impressed with the work schools are doing. The pupil premium is giving children and young people the best possible start in life, so that when they finish their education they can go for the jobs they have always dreamed of. There were 3 overall winners - 1 primary school, 1 secondary school and a special school. There was also a runner-up in each category, each taking home £3,000. The schools will be able to spend their prizes however they want to. TES worked closely with the Department for Education and Deputy Prime Minister’s Office to design the awards so that schools that had made a measurable difference in educational attainment were short-listed and recognised for their achievements. 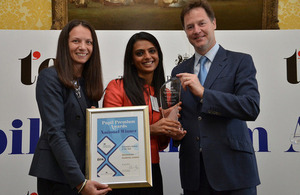 TES chief executive, Louise Rogers, presented the awards with the Deputy Prime Minister. The national winners were Longford Park School in Stretford in the special school category, Pakeman Primary School in Islington, and Westminster Academy in London in the secondary school category. These schools are exemplifying how the pupil premium can be used to give all schoolchildren the start they need in life. Longford Park used the pupil premium to invest in new IT, put on extra art classes and introduce new therapies. They also bought new music equipment and established a brass band which competes against mainstream schools. Pakeman Primary School used the pupil premium to provide more support for reading and to employ intensive one-to-one teachers for intensive learning. The Westminster Academy has seen most of its pupils massively improve, performing significantly above the national average for all students getting 5 A* to C grades including English and maths at GCSE. They used their pupil premium to invest in small group teaching, especially in English and maths.